The NFB of Rhode Island elected new officers at its October 26, 2002, convention. They are Richard A. Gaffney, president; Barry Humphries, vice president; Mary Jane Fry, secretary; Ken Bryant, treasurer; and Angelina Teixeira and John Carvalho, board members. A Federation plaque from O'Leary's Emporium. Marc Maurer, Barbara Pierce, Sharon Maneki, Steve Benson, Allen Harris, Kris Cox, Kevan Worley--what do these people have in common? Well, of course, they are all Federation leaders. In addition, they have used O'Leary's Emporium to supply high-quality plaques, which have been produced exactly right. Not only can O'Leary's create perfect plaques for presentation to your award winner, we can also include the engraved Whozit logo. Plaques are available in a variety of sizes to meet your specific requirements. Plaques will be shipped by UPS approximately two weeks after receipt of your confirmed order. Please mail, e-mail, or fax your typed plaque order (after double checking spelling). If you wish, we can assist you with wording, punctuation, and design. For NFB affiliates our prices are 25 percent below our standard retail. We accept all major credit cards. We offer other commemorative items as well, which can be engraved and can include the Whozit logo. Don't delay. To recognize or commemorate a person, deed, event, place, or service, call O'Leary's Emporium for highest-quality engraved plaques. Contact O'Leary's Emporium, P.O. Box 479, Emmitsburg, Maryland 21727, fax (301) 447-2799, phone (301) 447-2795, or e-mail <olearysnfa@aol.com>. 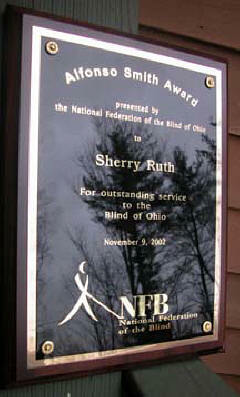 The NFB of Oregon Rose City Chapter conducted elections on November 16, 2002. The officers are president, Carolyn Brock; vice president, Laine Gardinier; secretary, Jerry Hathaway; and treasurer, Joyce Green. Notices and information in this section may be of interest to Monitor readers. We are not responsible for the accuracy of the information; we have edited only for space and clarity. Pathamon is in need of a family. The World Association for Children and Parents (WACAP) is seeking an adoptive family for Pathamon, an affectionate little girl of seven who loves her trampoline. Pathamon was born blind and with hearing loss in both ears. In January 2002 she had surgery for her hearing, which is reported to have improved dramatically since the surgery. 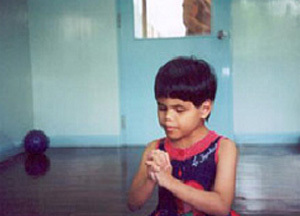 The caregivers at the orphanage are eager for her to have parents of her own. They care deeply about her and are concerned whether they can do everything possible to help her reach her full potential. For more detailed information contact WACAP's Family Finders Team at (206) 575-4550 or <familyfinders@wacap.org>. WACAP will mail her photos, video, and medical information upon request. Financial assistance is available for the adoption of this child. The Braille Authority of North America (BANA) announces a change in terminology to what has been traditionally known as Grade 1 and Grade 2 Braille. These categories will now be referred to as uncontracted and contracted Braille respectively. The change is being made at the request of many in the blindness field. People often confuse grades of Braille with first and second grades in elementary school. BANA believes that the change to more accurate descriptive language will increase awareness and improve the overall understanding of how Braille is learned, read, written, and transcribed. BANA urges all organizations, agencies, teacher-training programs, Braille-production facilities, software developers, professionals in the field of blindness, and Braille readers to incorporate this terminology into writing, publications, presentations, and general practice. The ultimate goal is to enhance understanding and more accurately reflect what Braille truly is--a versatile and effective reading and writing system for people of all ages. Does your child enjoy a book series so much that he or she would love to read every book in it? Is the whole class talking about a new book, but your student hasn't had a chance to read it because it's not yet available in Braille? Introducing The Braille Bookstore's Read What You Want program. We'll transcribe any popular book for ages two to twelve into Braille at no charge. Your only cost is our everyday low Braille-production prices (based on the number of Braille pages). For instance, you can order any book in the Magic Tree House or Cam Jansen Adventures Series in Braille for just $6.95; any Goosebumps mystery for only $15.95; or any title in the Babysitters Club or Nancy Drew Mystery Stories collections for $19.95 and $21.95 respectively. And since we can usually get a copy of the print book you want transcribed locally, you won't even have to mail it to us. What all this really boils down to is that kids can now read any book of their choice in Braille a week or two after you call us, without its costing you a small fortune. Give us a ring at (800) 987-1231, or send an e‑mail to <transcription@braillebookstore.com> today to get us working on whatever book you want. One more thing: over a thousand Braille titles are already available for all ages from our online catalog. What's more, we have a gift shop and a Learning Braille category, featuring such popular items as Print/Braille flash cards, Braille magnets, bookmarks, key chains, calendars, playing cards, tactile board games, and gift certificates. On our Web site you can even type in a list of words or names for us to use to make print/Braille flash cards for just $6.95. You can browse through our online bookstore (and order right on the Web site using our screen-reader‑friendly, completely secure shopping cart) by dropping by <www.braillebookstore.com>. Dancing Dots announces the release of CakeTalking for SONAR, software that gives the blind user premium access to Cakewalk SONAR. Blind music students, composers, arrangers, performers, and audio professionals can now easily access the features of Cakewalk's powerful mainstream digital audio and MIDI software. Using CakeTalking and the JAWS for Windows screen reader, blind musicians can independently create sound recordings and printed versions of their musical ideas with SONAR. SONAR converts your PC into a multitrack, digital audio and MIDI recording studio. CakeTalking customizes the way the JAWS for Windows screen reader behaves with SONAR's user interface. The result: blind musicians can spend their time creating, not configuring JAWS to cope with SONAR's graphical presentation of information. In addition, CakeTalking for SONAR comes with a sophisticated online help system and detailed documentation for the blind JAWS user, useful to beginners and experienced musicians as well as audio engineers. The initial release of CakeTalking 3.0 is for Windows XP (both Home and Professional editions) and Windows 2000. A version compatible with Windows 98 and Millennium will follow very soon. Customers must have JAWS version 4.5. Various versions of all these products can be ordered directly from Dancing Dots. Special pricing on some products may be available from the Web site <www.dancingdots.com>. For more information contact <info@dancingdots.com>; 1754 Quarry Lane, PO Box 927, Valley Forge, Pennsylvania 19482‑0927; phone (610) 783-6692; fax (610) 783‑6732. Eileen Fleming has established a listserv for blind knitters and others who enjoy yarn crafts. She says: VIP-SHEEP-TALK is a list for blind and visually impaired people who enjoy yarn-related crafts (typically knitting or crocheting). However, if you have another yarn craft you find enjoyable, come and join us because we'd love to hear what you're working on and how you manage the craft. This is the group to join if you want to share and learn patterns, get the scoop on yarns and related supplies, get some help on one of those difficult-to-learn patterns or stitches, and make new friends. It doesn't matter if you're at a beginning, intermediate, or advanced level in your craft; we're looking forward to hearing from you. Our shoptalk is about more than sheep. It can be about cotton, silk, goat, rabbit, man-made fibers, or anything else pertaining to a yarn craft. Please note, however, that advertising is not allowed. To subscribe to VIP-SHEEP-TALK@yahoogroups.com send a blank e-mail message to <VIP-SHEEP-TALK-subscribe@yahoogroups.com>. To post a message, send it to <VIP-SHEEP-TALK@yahoogroups.com>. To unsubscribe, send a blank e-mail to <VIP-SHEEP-TALK-unsubscribe@yahoogroups.com>. And to contact the owner and moderator, Eileen Fleming, e-mail <etflemin@ix.netcom.com>. National Braille Press is pleased to announce the publication of a new book featuring twenty-five gardening and garden‑related projects for any time of year: Kids Gardening is in a large print/Braille edition in one volume, for $13.95. It includes free seeds and shovel. This is the gardening book for any climate, any time, any place, and anyone. This entertaining project book describes all the ins and outs of growing plants-‑both indoors and outdoors. Whether you want to grow an avocado seed in your kitchen window or plant an entire vegetable and wildflower garden in the back yard, this book has all the information you'll need in clear, easy‑to‑understand language. We've also included a list of helpful tips from a blind gardener. To order, send $13.95 (same price as print book) to National Braille Press, 88 St. Stephen Street, Boston, MA 02115. Or call us toll‑free at (800) 548‑7323. We offer customized Braille transcription service that meets the individual needs of the customer. Print can be transcribed into Braille at modest prices for all kinds of documents, including bulletins, agendas, menus, theater programs, employment materials, legal documents, letters, lists, invitations, labels, and much more. Documents can be received on disk in MS Word format, and e-mail attachments. For more information about this service give Kerry Smith a call at (314) 644-7733, or e-mail <kerrylsmith@prodigy.net>. Imagine accessing the Internet without a computer when you are on the go, stuck in traffic, or just away from your computer. Sound like science fiction? Not any more, using InternetSpeech's netECHO�, the only voice Internet service to give you access to the entire Web. No computer is needed. You can surf and browse any Web site, listen to and respond to your e-mail, do a search on any word, and much more. Pretty much anything you can do with a computer and a visual browser can now be done with any phone and your own voice. If you have a phone, you have access to the Internet. The rates are very affordable. Program A: $9.95 a month, unlimited use. You call a toll number in the 408 area code. Program B: $19.95 a month, includes three hours of use. After three hours, $2.50 for every thirty minutes. Both programs have a one-time set-up fee of $20. Just call (877) 312-4638 to take advantage of our introductory specials. You can also visit our Web site at <www.internetspeech.com>. The notices in this section have been edited for clarity, but we can pass along only the information we were given. We are not responsible for the accuracy of the statements made or the quality of the products for sale. 5. One user's guide on VHS and one installation guide on VHS. The security system comes with the installation guide and user's guide also in PDF (portable document format) on a CD-ROM, allowing a sighted person to program the sensors and options. I am asking $200 or best offer. The Simon 2 works perfectly. If interested, please e‑mail me at <chrisg@acsu.buffalo.edu> or call (716) 510‑5409. Ameenah Ghoston has a Kurzweil Reading Edge for $475 or best offer. Also a Braille 'n Speak 2000 for $500. For more information call (217) 355‑9784 or e-mail <ghoston@students.uiuc.edu>. Jim Blacksten from San Francisco has two Braille displays and a Braille/graphics printer for sale at reduced prices. All equipment is in good working condition. For more information or to make an offer, please call (415) 495‑3101. I have a Smartview CCTV with 21-inch ViewSonic monitor and on-screen calculator/time/date functions. Barely used. Originally $3,600. I will sell for $1800. Call Renee at (704) 263‑1314 and leave message. Or e-mail <reneabne@bellsouth.net>. Outlook color CCTV, asking $1,500 (negotiable). Contact Philip I. Brake, 9100 Gue Road, Damascus, Maryland 20872, (301) 253-3136. CCTV, Aladdin Ultra Pro 75 by Telesensory, less than one year old, asking $995. If interested, contact Hyman Easton, 320 E. Shore Road, Great Neck, New York 11023, (516) 487-7882. I pledge to participate actively in the efforts of the National Federation of the Blind to achieve equality, opportunity, and security for the blind; to support the policies and programs of the Federation; and to abide by its constitution. The National Federation of the Blind has chapters in all fifty states and in almost every local community in the nation. The Federation has more than 50,000 members and is working to help the blind to have full and meaningful lives. It is not financed by the government but depends for support on contributions from its Members, and its Friends.